The TD Cash Credit Card currently has an Informr score of 7.4 out of 10. This score is based on our evaluation of 8 sources including reviews from users and the web's most trusted critics. 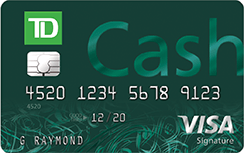 TD Cash Credit Card is typically available to those with excellent credit scores (650 or greater). If you mostly spend on dining and groceries, the TD Cash Credit Card can be a good choice. In addition to cash back, you get a generous signup bonus and a long intro APR period on balance transfers. The TD Cash Credit Card is not the best credit card out there, but it's not bad either. The 2% cash back you can get through this card on dining is fantastic. Coupled with the fact that it has no annual fee, the TD Cash Credit Card can be a decent secondary card. A nice introduction for those looking to get their foot in the door with a solid cash back card with no annual fee. The simplicity of the categories eligible for cash back rewards with this card also gives cardholders less to worry about in making sure they’re maximizing their earning potential. This card is designed for people who want to earn money back on everyday purchases for things like: going out to eat, grabbing a quick cup of coffee, or for every day purchases. The rewards program is straight forward and simple. You don’t have to worry about keeping tabs on special spending categories to earn cash rewards. The TD Bank Cash Credit Card has the broadest appeal among the family of TD Bank cards. That’s thanks to Cash Visa’s easily attainable $150 initial bonus, straightforward cash-back rewards and lack of an annual fee. We believe this card is a good fit for someone who spends a lot of money each month on eating out, as the 2% rewards rate can produce a fair amount of rewards each month. The TD Cash Visa is best for those who frequently make purchases categorized in the dining category, whether it's fast food, convenience store, or coffee shops. You also have an opportunity to earn a nice cash back bonus if you meet the spending requirements.